Is this where I came from? Back in the mid-1990s two cultural/economic trends were dying away: the vinyl and the death metal genre. This concurrence brought happiness to a small group of friends from Nikaia, a suburb of Piraeus in Greece, who were just starting to discover extreme metal. By that time, death metal had undergone a period of explosion, saturation and relative stalemate, and was considered a thing of the past in mainstream metal circles (the same goes for traditional metal and thrash). Melodic and highly canonised black metal, on the other hand, was spreading its wings. At the same time, the CD had been widely accepted as the orthodoxy in music dissemination. The vinyl was deemed an inefficient format for music storage; it takes up too much space, it is vulnerable, it cannot carry more than 50 minutes of music among its delicate grooves without compromising the sound quality and, finally, its sound is inferior to the polished digital sound of the CD, which is also small and more easily storable, can hold up to 80 minutes of music and, or so it was claimed, it could live forever. 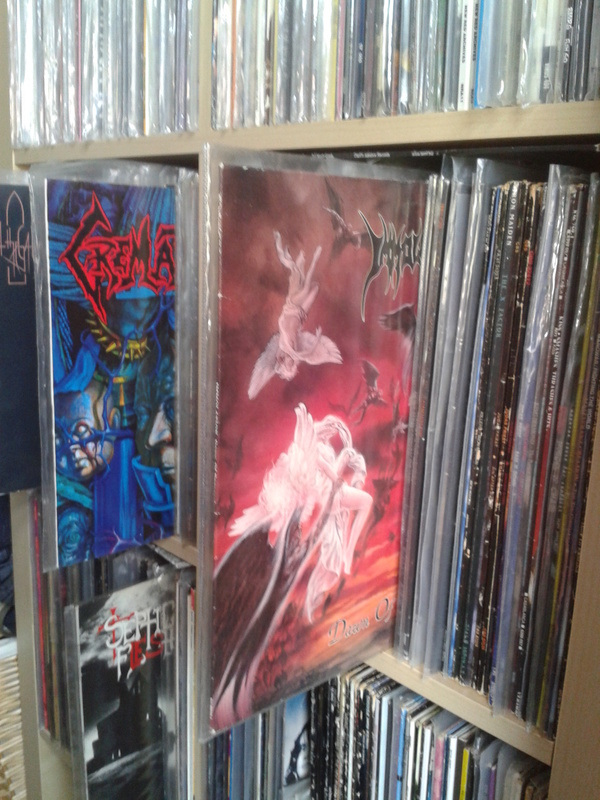 Nevertheless, these two trends – the cultural and economic depreciation of vinyl and (death) metal – resulted in another brilliant trend that made us oh-so-merry: the mid-1990s was a heaven of ridiculously cheap second-hand vinyl records of metal bands. At the time, me and my friends were in secondary school. Before metal, our cultural consumption was limited to sports shoes (I am not kidding), fast food and, in the case of some people, video games. Then metal came and became an all-encompassing leisurely activity. For some of us there was nothing beyond metal music, although some still placed loyalty in football or video games, albeit to a lesser extent. Back then, every single album obtained, in any type of format (cassette tape, CD or vinyl), was a treasured artifact. Every single album was laboriously listened and appreciated. Listening to music, sometimes an individualistic and other times a social experience, was done with passion. My weekly allowance at the time was 1000 drachmas (approximately two British pounds) and 1500 drachmas a bit later on. From time to time, my grandparents would also give me an one-thousand drachmas note on top of that standard allowance. Today it may sound crazy, but at that time this weekly allowance was enough to buy one cheese pasty and a soda per day from the school canteen. That’s how my parents intended me to spend my money. When I started listening to metal I started saving this allowance to buy cassette tapes in order to copy my friends’ albums, as well as CDs and vinyl. The first metal album I made a cassette copy of was Iron Maiden‘s Number of the beast, owned by a friend living in the same building as I did. The first CD I ever bought was Iron Maiden’s Live after death. The first metal vinyl was (surprise, surprise) Iron Maiden’s Fear of the dark. As I have explained in an earlier post, there were several factors that eventually made vinyl our format of choice. One factor was a specific “record collectors” discourse – which is currently stronger than ever – according to which vinyl is both an investment and a subcultural artifact which gives its possessor prestige and legitimacy (among one’s peers). Another factor was financial; vinyl used to be slightly cheaper than CDs (the opposite of what happens today). Nevertheless, the aforementioned first few metal albums were bought from local record stores (D.J. records and 5000 V) and were quite expensive (3000-3500 drachmas each). The decision to buy vinyl was not fully determined until we discovered second-hand record stores, where we would find a much bigger volume of albums in much lower prices. Not before long, me and my friends discovered the numerous second-hand record stores at the centre of Athens. The record stores in Monastiraki, Athens, were the ones I early on bought records on ridiculously low prices. Morbid Angel‘s Altars of madness for 1500 drachmas from Tsampas, Xentrix‘s Shattered existence from 7 plus 7 for 1750 drachmas, Massacre‘s From beyond for 1500 drachmas from Shiva records, are some of the great bargains I can remember. Of course the other music retailers (that were selling both new and second-had albums) in Athens were also great. Who can forget the awesome Happening that also had great offers, the two Rock City stores, and Jim’s Metal Era. For at least two years these stores were our temples of metal appreciation. Then a great revelation happened in early June 1997. 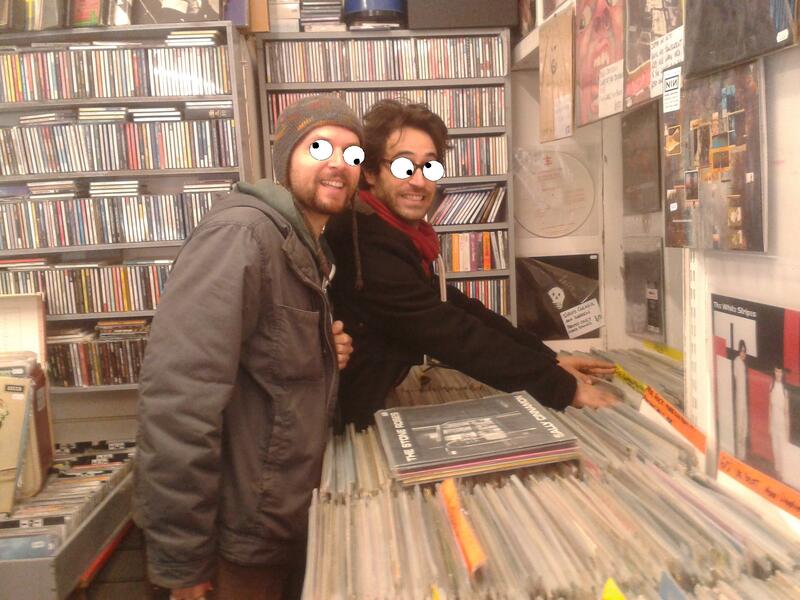 It was after the summer physics exam when me and my friend Dimitris decided to go to Athens on a record hunt. When we got off the bus at Koumoundourou square we saw another friend, Nikos, who was just returning from his record hunt and he told us about this awesome record store he had found, that had the best prices ever. Its name was Art Nouveau, at Solomou street, Exarcheia. However, we did not visit it on that day. Instead, I bought the newly released Dismember Misanthropic e.p. from Metal Era and returned home ecstatic. Art Nouveau proved to be one of the best record stores ever. It was founded by Nikos, an avid fan of rock music, in 1983. (The store apparently operated also as the “headquarters” of Nikos’ independent music productions company which released the Αδιέξοδο (Dead End) – Γενιά του Χάους (Chaos Generation) split tape in 1983.) The metal section consisted of three stalls on the right hand side of the entrance to the back room. Each stall contained 50-70 records. All the records had been removed and stored, so the customers browsed through the record jackets. On the top right corner of each album there was a tiny hand-written price-tag. The price was also written in pencil on the inner sleeve. As I write this post I am listening to Morgoth‘s Cursed, which I bought from there for 1800 drachmas (3,5 pounds). Other notable records I bought from there include Paradise Lost‘s Gothic for 2000 drachmas, Pungent Stench‘s first album for 1800 drachmas, and Cannibal Corpse‘s Butchered at birth and Cadaver‘s Hallucinating anxiety for equally ridiculous prices. Art Nouveau can nowadays be found at 42 Arachovis street, Exarcheia, still preaching the old rock gospel and stubbornly resisting music fads and the pressures of big music retailers, music digitisation and the internet. Old habits die hard, and even at a time when some of the most obscure music can easily be obtained by anyone with internet access, all the people who came together in that group two decades ago still buy vinyl records. For most of us it is no longer a matter of prestige. It is simply that we know no better way to enjoy music. Because, all those who have been part of the social organisation of vinyl-purchasing (the excitement of patiently browsing through thousands of albums for hours on end and eventually finding an album you were looking for, finding a hidden phrase engraved on the vinyl close to where the label is, looking at the pictures of the musicians, reading the “Thanx lists” trying to understand who is friends with whom and to discover new bands, finding out who composed what, reading the lyrics, carefully examining the artwork, and smelling the cardboard odour off the record jacket), know that it constitutes an experience that enhances the experience of music-listening itself. Me and my friend Nikos, 19 years after our first record-hunt. Dismember has been my all time favorite band since the mid 90s. I discovered death metal through the sounds of Dismember and other great Swedish bands such as Unleashed, At the gates and Grave. The first record I heard was the back then newly released Massive Killing Capacity. The impact of this album is probably much bigger than I can perceive. I remember getting a guitar on my hands in order to learn to play the opening riff of “Collection by blood”. It further increased my already significant obsession with learning as much trivia as possible about bands. Categories started forming in my head about each individual member’s composing style. Within a few years and when a new album was coming out I could tell with certainty who had writen which song without even looking at the inner sleeve or booklet. Tagalos: “more brutal than both of them”. One day in the summer of 1997 I spent all day in Metal Era with Jim (ex-Rotting Christ bass player) and his friends while waiting for the very first vinyl copies of Death Metal to arrive. I remember the day I listened to the promo-cd of Hate Campaign and I run home to tell my friends about it. The freezing day I streamed the song “where ironcrosses grow” before the release of the album (it was Sunday and it had snowed). I got to see Dismember live in the summer of 2005, with a ticket my friend Joan gave me as a present for my birthday. I had the honour of meeting Matti, David and Fred on that day. I was super excited for meeting my heroes, them for seeing a fan with a Dismember tattoo on his arm. The concert was like a dream that came true. They even played Reborn in Blasphemy! After the departure of Fred, I knew that the future of the band would be uncertain. Fred was the motivator, an important composer and the producer. Of course, one of the things I always liked about and respected Dismember for, was that it was not an one-man band. Every album was a collective effort. And before Fred left, I was equally bummed out about the departures of Robert and Rickard, both of whom are amazing composers. Dismember seemed to me like a band which had a very laid back work ethic, which is something I respect greatly. It was also a very humble band and having met them I can say that they were not taking themselves very seriously and their primary goal was to have fun and play music they enjoyed. They survived a period very difficult for extreme music (mid- to late-90s) and they did so with dignity. Ok they got a bit more melodic as time went by… but one can see those melodic elements even in their early works. They had always been more into melody than their contemporaries. In a period of 20 years they offered the world some of the most beautiful music ever created, some phenomenal lyrics and some of the most powerful and extreme executions. They certainly co-defined what swedish death metal means. They consistently released flawless albums, a feat that only a handful of bands have managed to pull off. A week ago they anounced that they will call it quits. This post is an opportunity for me to thank them for being such an inspiring part of my childhood and adult life. In the mid-nineties in Greece internet had not yet proliferated everyday life. There were only a few homes with access to internet and, in any case, the internet was still a baby. Tape trading was still the dominant mechanism for the sharing of music. However, me and my close friends did not really want to be a part of the (death) metal sub-culture. We considered most metalheads stupid and that they were listening to the wrong kind of music. We had built our own counter-culture in which we found th devil-horns sign silly, we did not like some of the more established metal bands, especially the ones that were more established in Greece, and we refused to take part in some of the metal rituals, such as hanging out in metal clubs. Partially that was happening because we prefered to spend our limited allowances on records than coffee or beer. So our small musical network back then was comprised of 4-5 kids from school. Part of this network were the older brother of one of my friends, the older cousin of another friend and 2 kids from another town (Volos) that were friends with one from our group. This was a particularly small network, even if you account for the fact that the two kids from Volos had more connections that were indirectly connected with us. However, that allowed us to experiment with buying records that were more obscure and more importantly, it allowed us to really appreciate and cherish the few albums that were going around. Of course, the social construction of what constitutes Death Metal did not take place exclusively within the confines of our small group. One early guide to death metal came from the greek metal hammer magazine. In 1996 the greek metal hammer published a list of what the editors considered the 15 best death metal albums of all time. That list guided me and my friends on our first explorations of the death metal scene. Although we were already listening to some death metal like Benediction, Dismember, Unleashed, At the gates, Sarcofago and Death our knowledge beyond these bands was very limited. That list was therefore particularly helpful, since it shaped to a large extent our ideas about what death metal is and how it should sound like. The albums on that list included: Altars of Madness (Morbid Angel), Transcend the Rubicon (Benediction), Indecent and Obscene (Dismember), Clandestine (Entombed), Heartwork (Carcass), Maleus Maleficarum (Pestilence), Last one on Earth (Asphyx), For Victory (Bolt Thrower), From Beyond (Massacre), Cause of Death (Obituary), Harmony Corruption (Napalm Death), Across the Open Sea (Unleashed), The Ten Commandments (Malevolent Creation), Leprosy (Death), Deicide (Deicide). I have this strange feeling that either Onward to Golgotha, Dawn of Possession or the Bleeding were also included but I cannot be sure since I have unfortunatelly lost this issue. Anyway, this list reflected the subjective tastes of the magazine’s editors, I am guessing Taggalos and Efkarpidis were among them. Although later on I came to hate Metal Hammer and all attempts on evaluating music according to personal criteria that assume are universal, I cannot deny the fact that this list was a beginners’ guide and introduction to a very time-and-place-specific death metal sub-culture. I remember buying some of these albums on cassette because they were cheap and we did not fully trust metal hammer. Back then Happening, one of Athens’ largest record stores, was still around but the undisputed metal record stores were the two Rock City stores, particularly the underground one on Akadimias street. The symbolic elements that made this store so loved, like the fact that it was in a basement, the dark walls, suffocating atmosphere and the metalic black cd -racks were all lost after the store moved further down the street and was refurbished to look fancy and new. From the underground store, I bought some of the cassettes I saw on that list, such as Maleus Malleficarum and Last one on earth for 950 drachmas (around 2 quid). The cassette series was an invitation to further experimentation with bands like Gorefest, Paradox, Tiamat, Gorguts and others. Almost 15 years and hundreds of albums have passed since and I still think that this is a pretty damn good list. It contains important representatives from different schools (Swedish death metal, american death metal, british death metal and European death metal). This list also reflects the values of death metal fans in greece at that period. Among the albums there is only one that would fall under the technical death metal categroy, Heartwork by Carcass. Altars of Madness is also technical for sure, but what sticks out is the brutallity. Most other albums on that list are extremely crude, dark and brutal. Furthermore, one can find albums that would never make it in a similar list today! I doubt it that today’s death metal fans would appreciate any albums by bands like Asphyx, Bolt Thrower or, especially, Benediction. Now I’ll get back to listening to Last one on Earth and be amazed by the heaviness and phenomenal lyrics of Martin Van Drunen.